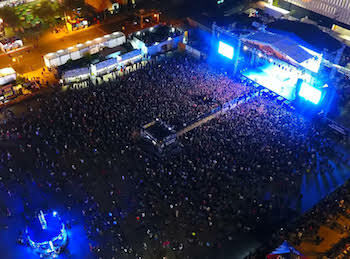 In its inaugural year, Las Rageous wrapped with nearly 20,000 in attendance over the weekend of April 21 and April 22. 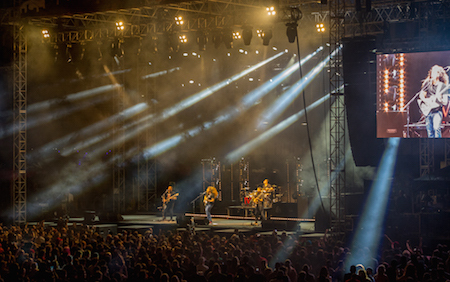 Rock and metal fans from all over the world flocked to the intimate outdoor location right in the heart of Downtown Las Vegas to catch energetic live sets by some of their favorite acts, including Avenged Sevenfold, Godsmack, Anthrax, Breaking Benjamin and more. Fans were delighted by a number of musical surprises including Anthrax singer Joey Belladonna joining Killswitch Engage for a cover of Dio's "Holy Diver," along with Mastodon guitarist Brent Hinds joining Eagles of Death Metal during their hit, "I Only Want You." Additionally, the festival served as Avenged Sevenfold's first U.S. show since the release of their latest album, The Stage, and Of Mice & Men's first show with their current lineup. 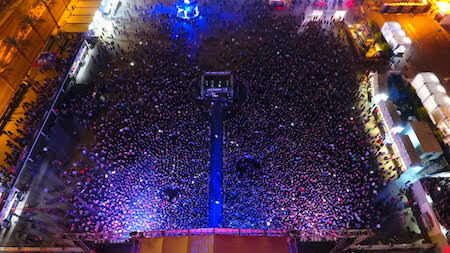 "Las Rageous was a monumental event for the DLVEC and took Downtown Las Vegas by storm," said owner and CEO of the Downtown Las Vegas Events Center, Derek Stevens. "I'm incredibly proud of our first original festival and can't wait to invite thousands of guests back for years to come." "We are overwhelmed by the response and crowd turnout for this festival," said Kurt Melien, president of Live Nation Las Vegas. 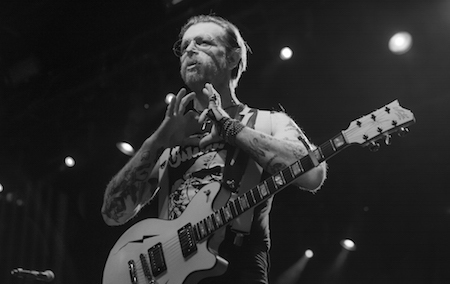 "The inaugural Las Rageous was everything we could have hoped for. Vegas is home to an incredible rock culture and we're thrilled to be able to give this passionate group of individuals an event that is theirs to celebrate. We look forward to bringing Las Rageous back for many years to come." 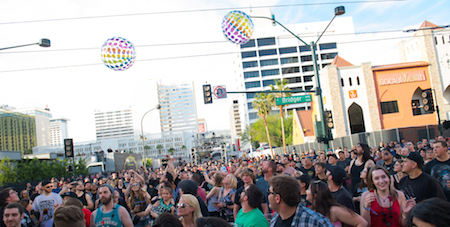 "This new fest, which got off to a strong start over the weekend, luring thousands to the Downtown Las Vegas Events Center and adjacent streets, delivered a broad array of bombast, from prog to metalcore, thrash to radio rock, the festival's two stages bracketed by food trucks and fire twirlers in hot pants…"
"…Las Rageous Music Festival was a raging success…"
"The first ever (hopefully, first annual) Las Rageous Fest in Downtown Las Vegas was a clear hit. Both days — April 21 and 22 — were packed with rockers and metalheads waiting in 90 degree heat to see their favorite bands." The full music lineup for Las Rageous included Avenged Sevenfold, Godsmack, Breaking Benjamin, Coheed and Cambria, Anthrax, Mastodon, Eagles of Death Metal, Killswitch Engage, Of Mice & Men, All That Remains, The Devil Wears Prada, and Escape The Fate, plus Sin City locals We Gave It Hell, Nations, Code Red Riot, and A Friend, A Foe, along with KOMP-FM Battle Of The Band Winners Bravo Delta and Honor Amongst Thieves. Las Rageous was produced by Live Nation Las Vegas. Live Nation Entertainment (NYSE: LYV) is the world's leading live entertainment company comprised of global market leaders: Ticketmaster, Live Nation & House of Blues Concerts, LN Media and Artist Nation Management. Live Nation Las Vegas produces residency shows from Britney Spears, Jennifer Lopez, Lionel Richie, Backstreet Boys and Pitbull at The AXIS at Planet Hollywood Resort & Casino; Bruno Mars and Ricky Martin at the Park Theater at Monte Carlo; and Steely Dan at The Venetian Las Vegas. Live Nation Las Vegas also brings other world-famous artists to many of the city's other premier concert venues including T-Mobile Arena, Mandalay Bay Events Center, MGM Grand Garden Arena, Las Vegas Village, Pearl Concert Theater at the Palms, House of Blues, Downtown Las Vegas Events Center, The Joint at Hard Rock Hotel & Casino Las Vegas, and more. For additional information, visit www.livenation.com. Find Live Nation Las Vegas on Facebook, Instagram and follow us on Twitter.